I'll be honest, I'm not really much of a football fan. Or sports in general really. In fact, the fact that I know that a touchdown is a football term is nothing short of a miracle. Truly. I couldn't tell you one professional NFL team to save my life...let alone the names of any players or coaches. I may have grown up in Indiana, but I honestly had no clue about the Colts! That all changed when we moved to Indianapolis. Okay, okay...I didn't suddenly become a fan or get a clue about what the sport was all about, but I did very quickly discover that this was a town that was CRAZY for football. Everywhere we looked there was blue, blue, BLUE. And every Friday, even MORE blue. Even in my husband's job as United States Marine Corps recruiter, Fridays meant showing their Colts pride. My husband was also not a big football fan before the move, but that all changed when he was given the opportunity to meet with some of the players. He came out seeing how genuine and kind the team truly was, and gained a new respect for them. The head coach of the Indianapolis Colts, Chuck Pagano, has become one of the most inspiring, intriguing personalities in the game of football. Only three games into his rookie season in 2012, Pagano was diagnosed with leukemia, sidelined by the side effects chemotherapy and months of recovery. Undeterred, Pagano didn’t let the confines of his hospital bed keep him from coaching: texts, calls, and emails kept him in constant contact with players, staff, and assistants. Motivated to be just as strong and determined as their ailing coach the team started winning game after game, compiling an impressive 11-5 record. The players weren’t the only ones touched by Pagano’s hope and strength of character. 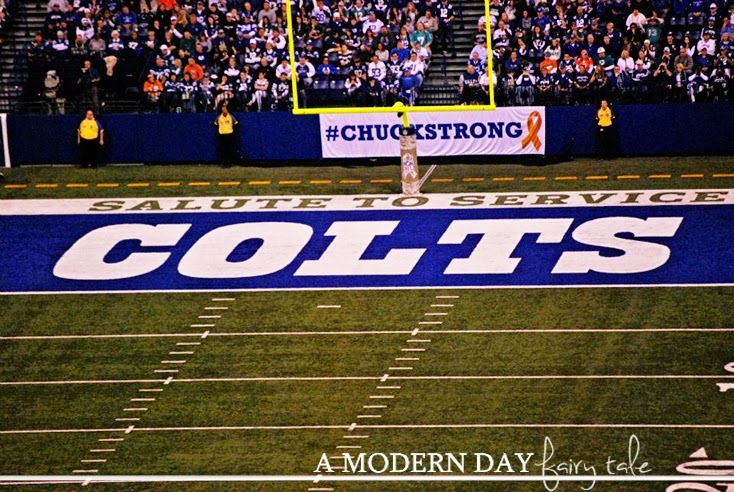 Inspired by the tenacity and toughness of their beloved coach, a newcomer to town, thousands of fans united to form Chuckstrong, a movement that soon raised millions to help beat cancer. Pagano, fueled by his faith, his family, and his love of football, returned to lead the Colts to another winning season and the divisional playoffs in 2013. 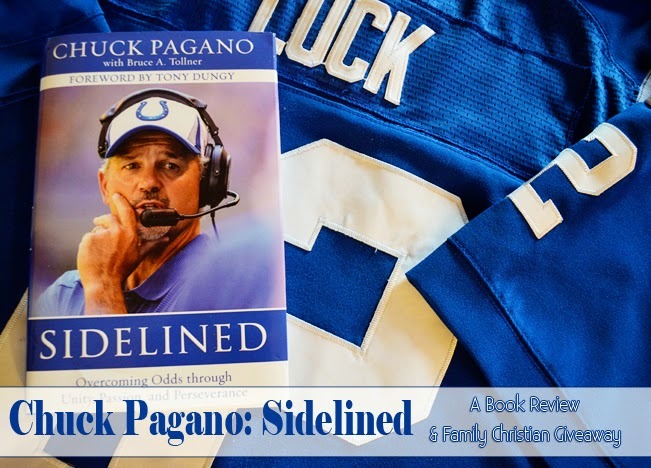 With Pagano’s practical lessons on living, loving, and leading, Sidelined, which includes an 8-page color photo section, inspires us all to stay in the game and never accept defeat. Having seen the Chuckstrong movement firsthand, it was very interesting to read the full story behind it. I was shocked to discover that Coach Pagano had not-as I'd assumed- been there for many, many years but in reality not even a full season. To me, this made the support shown so much more incredible and inspiring. It made me proud to live in such a place that would stand behind one of their own...even if that one was a newcomer. Again, I'm not a sports fan so there were perhaps a few places where I was a little lost on some terms, etc...but truly, you don't have to be a sports fan to appreciate this book. It is more than a story about a coach and his team, but really is a story of a family and a community. Whether you're a Colts or general football fan looking for the full story, or a sports novice looking for a great inspirational story- this book is definitely worth the read. You can purchase your own copy of Sidelined at Family Christian! And one very lucky reader is going to have the chance to win a $25 Family Christian Appreciation Certificate! Enter using the Rafflecopter form below. I would use it to get the Peanuts Christmas Pageant Nativity Play Set. I would like to get a DVD bible, but I like Carrie's idea too! I would love to win this to use on after Christmas sales! I would like to get a veggie tales dvd- maybe the Beauty and the Beet. 2014 Resolutions: How Did You DO? Countdown to Christmas with a Family Movie Night!